On Saturday afternoon, 19th inst.,five sail of the enemy’s naval force on Lake Ontario appeared off Sodus Bay. In the morning of the same day the enemy not appearing, Col. Swift’s regiment of militia which had formerly assembled for the protection of the place, was dismissed and left Sodus after having removed all the public property to a place of security. On the alarm being given about forty men, under Capt. E. Hull, collected with a determination to make all the resistance in their power should the enemy attempt to land. principal sufferers are Messrs. Edus, Merrill, Wickham and Nicholas. The above news is said to be furnished by a gentleman who arrived at Sodus Point soon after the enemy left the place. To the men of the present day who have known of Gettysburgh, Cold Harbor, Pittsburgh Landing, and the other battles of the late civil war, especially to the soldiers who served in those engagements, the events of 1813 at Sodus Point, and 1814 at Pultneyville, may seem trivial and scarcely worthy of notice; yet the bravery and fidelity of men must be judged by the circumstances of the case. When the citizens of Sodus and neighboring towns, with no military training, with none of the confidence that inspires disciplined forces, hurried to Sodus Point on the afternoon of June 19, 1813, and in the thick darkness of the rainy night, marched against an unknown force landing from a well equipped fleet, perhaps it required as much firmness , as much stern fidelity to duty as may have nerved veteran soldiers in the battles of far greater magnitude. lake. It was the policy of the British officers to hover along the coast, and if they found a place undefended, secure the stores, either by negotiation or force. A state of war also gave military excuse for the pillage and destruction of such villages, if the invading forces chose to avail themselves of the opportunity. Sodus Point had been guarded by a few of the neighboring militia companies, for several days at a time during the months preceding the battle. In June, or July, 1812, according to the affidavit of Asel Latimer and Isaac Featherly, in possession of the writer, a British vessel was seen upon the lake, apparently having designs upon the village. Captain Holcomb’s Company was called out, and remained at the Point under command of Lieutenant Nathaniel Merrill, for two or three days. Subsequently, during the summer and fall of that year, the same company was ordered out, and staid there one or two days at each alarm. In the spring of 1813, a considerable force was stationed from time to time, at the Point, in anticipation of an attack. On the 15th of June, it was reported that the British had landed at Genesee river, and would undoubtedly attack Sodus. Portions of Colonel Philetus Swift’s regiment, and of Major William Roger’s battalion, were immediately ordered there for defence, and remained until Saturday morning, when no enemy appearing , the companies were dismissed. A guard was retained under command of Lieutenant Merrill, to watch the military stores, which had been removed to the woods west of the village. That same day the British vessels came in sight, and in the afternoon it became evident that an attack upon the village was about to occur. One or two men on horseback were sent out to call back, if possible, the companies which were going home, and rally the citizens generally. One of them rode to Sodus village, and west along the Ridge, shouting: “Turn out!” “Turn out!” West of Sodus village, Paddock, Dunning, Danforth and others were just getting home from a “raising” on Morse hill, but tired as they were, they hastened to Sodus Point with such guns as they could hastily seize. The men that gathered at Sodus Point , in answer to this call, were some of them members of Captain Holcomb’s company, others of Captain Hull’s, and others still belonged to no organization whatever. The alarm called back some of the militia who were on their way home after their discharge in the morning, but many of the men were simply citizens, with no pretensions to military training. At the Point they had no organization. At first Rev. Seba Norton, who had seen service in the war of the Revolution, was looked to as a leader and Captain. A little later Captain Elias Hull reached the Point, and the command was yielded to him. The area of cleared land at the Point was not then very large. A thick, dense growth of trees and brush extended up to the covered most of the public square; its eastern edge running somewhat diagonally from the present site of the Methodist church to the northwest. This was almost impassable save by the single road, north to the lighthouse of the present day, thence west along the Lake bank, bearing south and reaching the line of the present road near the farm residence of B.B. Seaman. There was also a footpath which led off southwest from the place now occupied by the Methodist church. The night was very dark. It had been cloudy during the day and was raining a little in the evening. It was impossible to see a yard in advance. The information upon this point is not very certain yet it is entirely probable and consistent with the known facts. The “battle” was over. 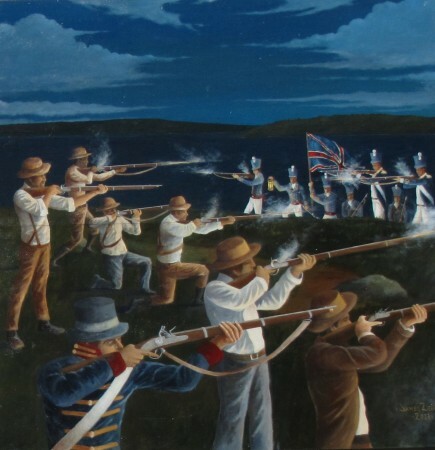 In the confusion that followed, the two forces were very near each other or mingled as the British carried off three prisoners, Christopher Britton, father of the late John Britton, of Alton, and Harry Skinner and also a colored man by the name of Gilbert Saulter. Both parties retreated and both for very good reasons. The British could have no idea of the force in their front, and in the darkness of midnight it would have been the height of folly to advance. They hastily took to their boats. The Americans knew their own weakness and had very good proof that a force much superior to them in numbers and discipline had landed. The Americans scattered, some to the woods, others to their homes. George Palmer says that he with others came up to the Pollock place on the old Geneva road and staid there till morning. The next morning the British opened a slight cannonade and then landed a small force. They seized the stores in the warehouses and then set all the buildings on fire except one. The tavern of Nathaniel Merrill, the store of Captain Wickham and its contents; his dwelling-house; the Fitzhugh house; the house of Wm. Edus; two warehouses and several other buildings were totally destroyed. The house saved was one that had been recently erected by Barakins and Hoylarts. It was the Mansion House of later years and was destroyed by fire in 1881. The tall solid chimneys of 1811 are still standing, marking the site of the old historic building. Asher Warner was picked up by the British mortally wounded and carried into this house and there he died. It is said that the British placed a pitcher of water near him and that the officers twice extinguished a fire kindled by the men to destroy the building. On June 20, 1812, President Madison declared war against Great Britain and the armed fleets of the Crown quickly appeared on the great American lakes to make war on the seaboard of the young republic and support an invasion. Sodus Point was then considered a place of some importance. The wide and deep roadstead of the village offered special advantage for the landing of a British force. So the Government forwarded stores to Sodus for the supply of American armies and in 1813 when the hostile fleet began to be frequently seen over the watery waste to the north a company of militia under Capt. Enoch Morse was sent to Sodus to guard against surprise. The government had not provided any coast defenses and had no time to do so. But there were hundreds of barrels of flour, pork and bread which for weeks all of the teams that could be obtained in this locality had been employed in drawing over to Sodus. The barrels were rolled into a ravine and corded up and night and day were under guard. On June 12, 1813, a thrilling event took place at Sodus. Early in the day a number of sail hove into sight and bore down to the entrance of the bay. It was plain that the long looked for landing of the enemy was imminent. The settlers at hand gathered on the hills and watched the maneuvering of the flotilla in its movement toward the bay. That same morning the company of militia had been withdrawn from the bay, leaving a small guard over the stores. The alarmed settlers at once organized to meet the emergency, having first sent a rider south across the country to spread the alarm, and then placed themselves on guard down in the ravine with sentinels posted upon the hill to report the movement of the fleet. The ravine where the stores were hidden lay between what are now West and Ontario streets. On that beautiful day in June another “Paul Revere” went galloping across the hills and dales of a thinly settled tract of country –now the fertile soil of Wayne county. His course was headed for Lyons where he found Captain Elias Hull who immediately marshalled his local troop and started for Sodus. Then the rider following the Montezuma turnpike, proceeded east arousing the country side. The next day was Sunday. 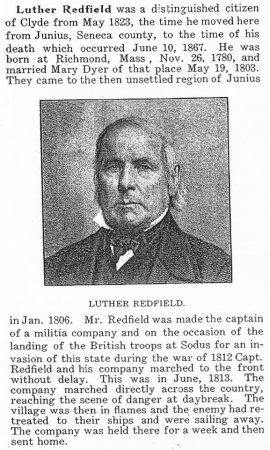 Over in Junius good Captain Luther Redfield hearing the news that Sodus was burning left church in the midst of service and calling his men together started north to aid in repelling the expected invasion. Through the long Saturday on which the alarm was given the few settlers did all that they could to prepare for defense. They selected for their leader Elder Seba Norton and as the day wore along they worked themselves into a grim determination to fight. At dusk the small boats from the fleet were seen approaching the landing. Before any number of the enemy had arrived on the ground darkness had settled upon land and water. Norton marshalled his small band in the bushes that then grew in the midst of the public square and awaited the approach of the red coats who were marching up from the landing. At the same time the Lyons company was close at hand, coming into the village from the south having hurriedly marched in. Help was badly needed if the stores were to be saved and Norton and his brave men, who no doubt would have fought alone if they had had to, gladly placed themselves under the command of Captain Hull. Two scouts, Pease and Gibbs, who had been sent out to reconnoiter, returned with the intelligence that the British were coming up on the other side of the hill in full force, although it was only a small company. Then followed the appearance of torches and a battalion of regular soldiery appeared on the crest of the hill greeted by a fusillade of shots from the bushes. The American militiamen, who had dared to fire upon more than their number of the Kings’ trained soldiers supported by a fleet with heavy guns, drew back in the darkness into the ravine and took position behind a breastwork of barrels loaded with stores. The light of the torches borne by the approaching troops must have given their commander a glimpse of what appeared to him as a large battery, for his men fired one volley then wheeling about deliberately march back toward the landing. The heads of the barrels showing in the dim, flickering light of the torches had deceived the commander of the invading forces. Down in the village the torches ere applied to the buildings as the boats put off from the shore. The next day other landing parties applied the torch, it evidently being the determination of the British commander to punish the settlers without moving his men father into the interior. Settlers armed and unarmed, and militia companies, were marching on the town and although there were 90 craft of all sorts off the lake but no attack on the village was made with heavy guns of the fleet. All day Sunday flames rolled up from the several houses in the village, the enemy in the meantime removing the stores that had been left in the warehouse at the landing, setting fire to the building and then putting back to the fleet, taking with them two prisoners, Messrs. Britton and Harvey who were captured in a skirmish that took place that day at the landing. The next morning, Monday not a sail was in sight. The vessels had retired during the night, but streams of smoke were pouring up from all points in the ruins of the village. Such was the sight that Monday morning which met the gaze of Captain Redfield’s men coming into town after an all night’s march from the south end of Junius in a drizzling rain.